Place Pesto Aioli ingredients in blender or food processor. Cover and blend on medium speed about 3 minutes, stopping occasionally to scrape sides, until smooth. Cover and refrigerate. Heat gas or charcoal grill. Soak skewers in water 10 minutes; drain. On 2 of the skewers, thread tomatoes, leaving 1/8-inch space between each piece. Repeat with remaining skewers and vegetables. Brush vegetables with olive oil; sprinkle with 3/4 teaspoon salt and the pepper. Place kabobs on grill over medium heat. Cover grill; cook until grill marks form and vegetables are fork-tender, 3 to 4 minutes for tomatoes, 7 to 10 minutes for bell peppers, 10 to 12 minutes for onion and 12 to 15 minutes for zucchini and yellow squash. 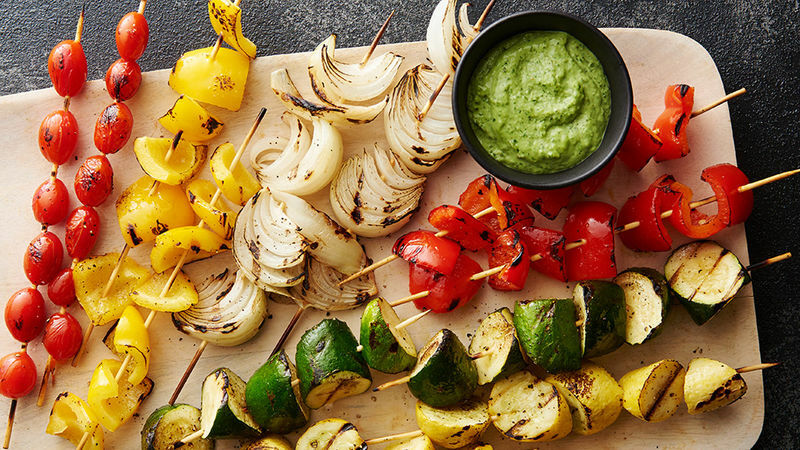 Serve kabobs with pesto aioli. You can make the pesto aioli up to a day in advance. Serve with quinoa or beans for a complete vegetarian meal. To toast pine nuts, sprinkle in ungreased heavy skillet. Cook over medium heat 5 to 7 minutes, stirring frequently until nuts begin to brown, then stirring constantly until nuts are light brown. Cooking Vegetarian? Always read labels to make sure each recipe ingredient is vegetarian. Products and ingredient sources can change. Metal skewers can be used instead of bamboo. Bamboo skewers are soaked in water so they're less likely to burn; there is no need to soak if you use metal skewers.